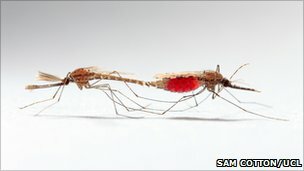 Scientists have created spermless mosquitoes in an effort to curb the spread of malaria. Experts say that this is an important first step toward releasing sterile males into the wild to reduce the size of mosquito populations. Malaria kills around one million people worldwide every year, and in Africa alone, accounts for 20% of all childhood deaths. The work is reported in Proceedings of the National Academy of Sciences. Insect sterilisation isn't new: scientists have attempted to control the sleeping sickness-carrying tsetse fly by exposing them to radiation to render them sterile. A similar approach has been successfully used against the potatoes weevil in Japan and the tropical screwworm that attacks cattle. However, exposing mosquitoes to radiation has tended to leave male mosquitoes frail, and unable to compete in the frenzied mating aerobatics that Anopheles gambiae - the world's most efficient malaria vector - enjoys. Now scientists have developed an alternative route to mosquito sterility. Entomologist Flaminia Catteruccia from Imperial College London enlisted the help of her graduate student Janis Thailayil in the search for how to make male mosquitoes sterile but leave them otherwise unharmed. Mr Thailayil injected 10,000 mosquito embryos with tiny fragments of RNA designed to turn off a gene - called zpg - that is essential for normal sperm development. After months of laborious work, the researchers created around 100 spermless mosquitoes, and showed that females were just as willing to mate with these males as with fertile ones. Dr Catteruccia explains that female mosquitoes mate only once in their lives. If scientists can trick them into thinking that they have successfully mated, then they will continue to lay their eggs without knowing that they have not been fertilised. "You [could] in principle release large numbers of sterile males over many generations… and eventually all the females will have mated with the sterile males and…you can really reduce the number of mosquitoes," explained Dr Catteruccia. This would gradually reduce the number of hatching mosquitoes. And hopefully help eradicate what many consider to be the single most dangerous insect species for mankind. However, Dr Catterucci warns that this is only a proof of principle. The method her team used to create the spermless males would be far too labour-intensive to flood wild populations with enough spermless males to have any effect on their numbers. However, knowing that females don't notice whether they are receiving sperm or not is still an important step, she said.